Ever have trouble juggling you phone case and wallet or purse? I recently was given a product to review that make the task a lot easier. 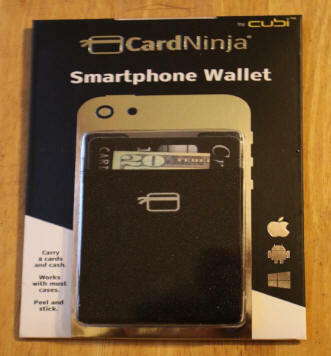 CardNinja Smartphone Wallet is a simple devise but very useful. It's a small pocket, only 2.5 mm thin, with an peel off backing. The way it works is you just peel off the backing and stick the wallet to the back of your phone or phone case. You then put you credit cards, drivers' license and cash into the wallet. The elasticized case front stretches to hold a lot and the special material keeps then in place even if you turn your phone upside down. Being a travel writer, I fly a lot and I discovered a great use for the CardNinja Wallet. Heading to the airport, I usually pack my purse in a carry on camera bag to limit my luggage. I then need to have my tickets, driver's license, and a few dollars for tips handy. Since I usually get at least one call on the way to the airport, I need the phone. CardNinja Wallet provided a perfect solution. I packed my purse and left out my phone case with the wallet attached to the back. I put my necessary papers in the wallet and stuck it in my pocket. 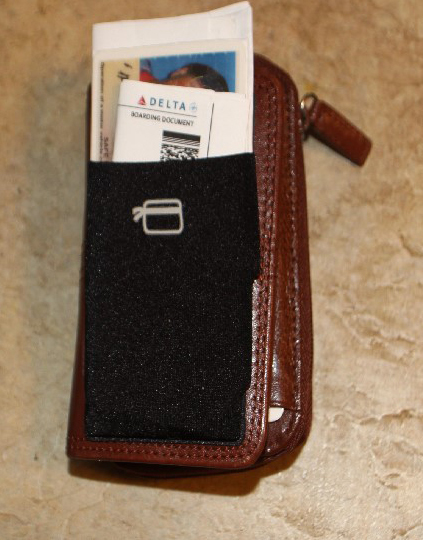 At the airport, my ID and boarding pass is right there in my pocket on the back of my phone case in the CardNinja Wallet. One hand is all I need to pull it out and give it to TSA. When I arrived at my destination, I discovered it was a perfect place to stick my hotel room key card. Just beware that is is not right next to your phone. The magnetism of the phone will sometimes kill your key card. In my case it is on the other side of my case with things between the Ninga Wallet and my phone. Another handy use I found is when I know I am going to be using a certain card, and don't want to carry a purse or even all my cards, I just stick the one I want right into the wallet, stick the phone case in my pocket and when I need it, just pull out the card I want. CardNinja Wallet may be simple but it sure is smart.